Useful Winter trees for TS2019?? Thread: Useful Winter trees for TS2019?? I have one or two favourite Winter routes from TS2004 days that I wouldn't mind shifting over to TS2019, but the main problem as I see it is finding trees that will look reasonable in TS2019. Some of the old tree models still manage to look reasonable, but a lot don't. So any advice anybody could give me about where the best trees might be found would be gratefully received. Or perhaps I should say advice as to who makes the best Winter trees since I already know they'll be somewhere on the DLS. Thanks for the suggestion, but I'm not sure that Speedtrees are going to look that particularly good with bare branches. I did try out some, but apart from two that seem to be Ok the rest were pretty naff. I have found some JVC Winter trees which have the fine spindly look that I'm after, but I was hoping that there might be more available. There is a good range of Roy's trees now built in to TRS19 and a lot of the RMM ones will be good as well. Combined with MSGSapper's truly seasonal textures you could have four seasons in one day. I'd suggest using CM to created a picklist of installed speedtrees, trainz build 4.0 and upwards. I've used this method to convert Morristown & Erie to fully seasonal. Most of the trees in this shot are Roys 4D trees. Last edited by grazlash; February 10th, 2019 at 03:55 PM. I have one or two favorite Winter routes from TS2004 days that I wouldn't mind shifting over to TS2019, but the main problem as I see it is finding trees that will look reasonable in TS2019. Some of the old tree models still manage to look reasonable, but a lot don't. So any advice anybody could give me about where the best trees might be found would be gratefully received. Or perhaps I should say advice as to who makes the best Winter trees since I already know they'll be somewhere on the DLS. 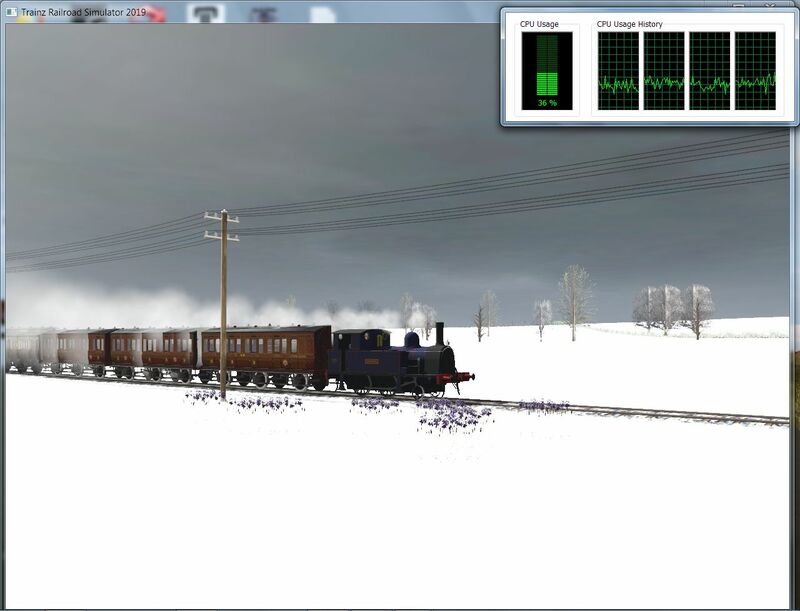 There's always something for me to learn in Trainz and I found some more winter Trees in the 2.9 and 3.7 versions on DSL I found I didn't quite have the rest of the Suite...........A good day indeed, courtesy of your Tree Thread here! I still much of a Neophyte with TRS19, but what I can say, with my new Laptop Driven with 1050 NVidia Card etc, etc,,,,,,I am really having fun, the most fun ever with my Routes and the really wonderful Graphics output..... . Please indulge me. When you say Roy's trees and RMM who do you mean in terms of a username that I could search with on the DLS. I have had a little luck with finding some more suitable Winter trees amongst the Speedtrees in TS2019, but the problem I'm having is that the old TS2004 models were quite diverse in the range of trees that they represented and also some of the trees were big, - a lot bigger than the current crop of Speedtrees. Hi Blue. I was a right little Luddite when TS2019 came along and very suspicious of it vowing that nothing would pry me away from my beloved TS2012. Well now I have to say this is how TS2012 should have been and I'm really enjoying learning how to make best use of TS2019. I do own T:ANE as well, but the way I see it T:ANE isn't worth my time anymore since TS2019 is just plain better. Smooth as silk. I could never get TS2012 to look like that in Task Manager. KotangaGirl - There are many of Roy's excellent speed trees built-in (came with the Canadian route) - Search Content Manager and the DLS for "roys_ " - Many are seasonal. Similarly, look for "st_rmm" (prefix) for RMM's trees and shrubs. Thank you very much Ace. Just the clues I was looking for. Thanks PC_Ace that's exactly what I would have said. I would also search "urst" for McGuirels freeware stuff TB 3.9 and above. There are also some TB 3.9 speedtree groups which are only accessible via picklists and the bulk asset replace tool to use them. They are only there for compatibility and are great for updating older routes. Just filter flora and min build 3.9 and sort on the build number. Highlight, right click and select add to picklist. There's now a huge range of PBR ground textures available, used in conjunction with the bulk asset update/replace tool you can update any old route to TRS19 standard in a couple of hours. You're welcome! - A few months back I invested a few hours of time creating a list of all of the latest, available TRS19 3D/ 4D speed trees - and seasonal textures - PBR content etc., and then planted an example of each in rows or strips on a blank, single baseboard route. My plantation now comes in extremely handy when I am looking for a particular tree or shrub-type when I am route-building. (Makes it much easier to select the "right look" than trying to scroll down the 'Add Object' list and looking at the thumbnail previews there, or trying to recall some of the obscure names given by some creators for otherwise excellent assets). You can just go into route edit mode and mouse-over the trees that match the look you're looking for to see the name of the tree (or ground texture) so that you can put it into the new route. (Change the month in the environment settings dialog to see seasonal differences). Also remember that Preview Asset mode in Content Manager now allows you to preview the Seasonal appearance of all seasonal assets. Last edited by PC_Ace; February 10th, 2019 at 09:23 PM. Your plantation idea is brilliant Ace and I can see how it would save a lot of time. Thank you very much for that. I love TS2012's preview asset mode. It is just such a useful tool. That went rather well. The old trees are all replaced and I'll most probably do some further tidying up here and there as I go along, but mission accomplished. I even got really carried away and replaced the ancient Auran track with seasonal procedural track.